Just back from Ireland on Sunday. The economic collapse is evident everywhere – lots of empty shops and offices, including in the main street (O'Connell St) in Dublin. The elections for the Senate were just finishing when I was there – I had a vote for the Senate National University panel – where 3 senators are elected by graduates. There were 27 candidates on the list and it was all by STV and PR and none of this half baked AV. The former Green senator on this list who had been appointed to the previous senate by the Taoiseach (PM) he is allowed to appoint 11, came something like 17th on the list. He was a former Mayor of Galway and riding high in the last government. The other former senator, Dan Boyle, from Cork stood for another panel (Industrial and Commercial) and came in very near the bottom. So the Greens have no representation at all in the current parliament. They are spoken of with detestation by all I met. There is going to be a referendum within the next year on the abolition of the Senate, as several of the parties are supporting this. This could lead to Ireland having a unicameral legislature. They are having a leadership election next month and there are three candidates. One is the former Energy Minister, Eamon Ryan, who is closely associated with the leadership and is seen as very reactionary. The second is a councillor from Kilkenny who was critical of their role in government but who is not exactly on the Left – indeed you will notice the lack of any ideological content in any of their videos. He is seen as having only a local profile and no national one and the last is a relatively unknown candidate who is, like Ryan, from Dublin. I met Bronwen Maher, former GP founding member and now Labour Party member, who spoke at the Green Left fringe in Brighton a couple of years ago. Her husband Steve Rawe was (irony of ironies) the former Head of Media Relations of the GP for several years. Steve is writing another piece on what happened to the Greens entitled ‘Forty Shades of Green’ which I will receive soon. Latest info is that the General Secretary of the party has gone and due to their current state of bankruptcy they are down to one employee, an admin assistant. Before the election they had 50. Their quango appointees still sit on some of the state boards but will disappear once their period of office expires. The general view is that membership has also collapsed. All of this is a grim warning for wannabe coalition partners with right wing parties. The teachers union, INTO, were having their conference when I was there and were stating that no graduate teachers had any employment hopes now in Ireland and that emigration was the only option. The new government seems locked into the IMF/European Central Bank bailout with its punitive terms. More and more scandals are emerging about what happened with the toxic banks. The former Finance Minister told the BBC that his government was ‘conned’ into the bailout while it has now emerged that the IMF were in Dublin at least a week before the government admitted they were there. The Greens are regarded as having sleepwalked or acquiesced in all of this. Meanwhile an economic report a few days ago stated the country’s economic state was worsening. All of this displays the spiral of cuts, followed by depression, followed by more cuts. As I have said before, Ireland is about 2 years ahead of the UK in this process. The new government is preparing for major welfare and other cuts because of the worsening deficit. I can see default as very likely at some point. Friends of mine who are in the public service have taken a major pay cut and the health service is in a state of crisis. There is growing resentment towards the EU and Germany in particular regarding the bailout terms, while the projections are for growing unemployment and a big drop in property prices. The tourism industry is hoping for holding on to jobs due to the Queen’s visit this month (the first British monarch since 1911) which is causing a huge security bill because of expected Republican protests and Obama later in the month (drinking the ubiquitous pint of Guinness in a village pub) and trying to secure the Irish-American vote. The united Left parties in the parliament (the Dail) are trying to resist the government’s economic policies. My feeling is that most dissidents have left the Irish Greens and that they will not be a political force for a decade or more. In between all of this catching up on the political and economic situation, I managed to enjoy some glorious weather and revisit a few haunts of mine from days gone by. I went along the river Liffey above Chapelizod, where I saw, for the first time in 35 years, the Trinity boathouse, where I spent three years as a coxwain in the rowing team and earned myself a few medals. It lies right inside the War Memorial Park, designed by Luytens, which is dedicated to those Irish soldiers who died in both world wars - they were busily spraying the stonework in expectation of the Queen's visit when I walked past. I also managed, for the first time, to visit the James Joyce Museum, in North Great George's Street and watched several fascinating documentaries on Joyce produced by the National Library of Ireland, one of which was about his legacy and included the hilarious remark from a contemporary Irish writer, that most of those who dressed up in Edwardian costumes on Bloomsday each June in Dublin, to renact the famous day portrayed in Joyce's 'Ulysses' "have probably never read a word of Joyce in their lives." I also managed to get a copy there of the famous and, as far as I know, only film version of the famous novel, filmed in Dublin in 1966. I also spent an evening in the famous pub 'Kavanaghs' known affectionately as 'the grave diggers' because the gravediggers still drink there, strategically located outside the gates of Glasnevin cemetery. The pub has not changed one iota since about 1880 and is mentioned in two Joyce novels 'Portrait of the Artist' and also 'Dubliners'. The old Royal Hospital in Kilmainham, which is probably Ireland's only Jacobean building of significance and which lay derelict for years has also been restored as the Irish Museum of Modern Art, where I saw a fascinating collection of paintings from the Gelman collection in Mexico of works by Frida Kahlo and Diego de Riviera. Both were fascinating and quite revolutionary in both their content and style. Finally, on the recommendation of a friend, I attended one of the worst performances ever of Lorca's 'Blood Wedding' which was less like a gypsy wedding in Andalucia and more like a drunken Irish wake in Kerry. I had not seen the play for many years and was not familiar with its plot but my partner Julio, who knew it well, said that it had simply no resemblance to the Lorca original. It truly was an Irish farce and my friend kept apologising profusely for bringing it to us. But as I have always found with theatre, there can be good plays but lousy productions. A good friend of mine is also involved in restoring old country piles and his latest expedition was down to County Roscommon in the West of Ireland, where he was working on a chippendale table. He regaled us with hilarious stories of the local town, including a pub which after closing time, ushered him into the back lounge which was full of the local Garda (police) having a late night sup - his host of the chippendale table was an ex-police officer. Rather appropriately, that day I had gone to visit an exhibition at the Irish Photographic Archive on 'The Big House' which is how the Irish refer to the houses of the former Anglo-Irish landed gentry. There were many photos of various Georgian and Victorian piles, one even including a photo of Queen Victoria visiting the house, with the curious servants hanging out the windows. 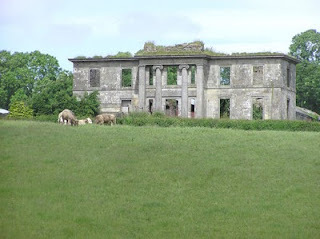 What was interesting was that many of the houses are still in existence, only a handful having been burned down by the IRA in the War of Independence, although some of them were now in the hands of religious institutions such as convents. And so history comes full circle with the first visit to Ireland by a British monarch since George V in 1911 and a visit which is seen as the 'normalisation' of relations between the two states and the two islands. However, despite my enthusiasm for history and heritage, I find it astonishing that Cork City Council are spending 250,000 Euros on restoring the 'English Market' in Cork city for the royal visit. The country may be bankrupt but still knows how to curtsy to a visiting British royal. The spirit of the Big House may be more alive than we think.